Two weeks ago, a Chinese ship named « Fu Yuan Yu Leng 999 » was arrested transporting more than 6600 sharks, some of endangered and even near-extinct species, in the Galapagos Islands. jail sentence for offense against flora and fauna. The ship was caught near the island of San Cristobal, while it was headed towards Peru, and planned to later get back to China, illegally crossing the Galapagos archipelago. These sharks were destined to be cooked and eaten, probably as the famous Shark fin soup, a very popular dish in China. 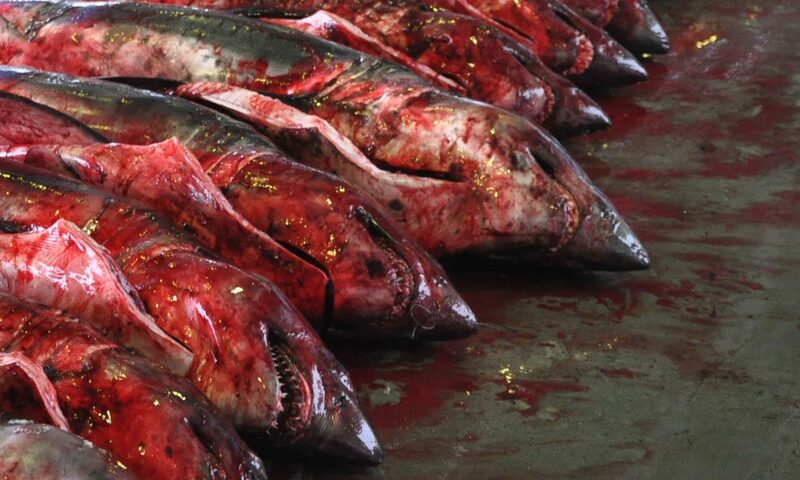 Some argue that this world-wide hunt for sharks makes the ocean less dangerous. Instinctively, we, humans, prefer the predating role. To eat instead of getting eaten. However, sharks have a very important purpose: they are the « garbage men » of the oceans, eating away dead, sick or weak animals. They are also a key component for the balance of ecosystems, and their decline can trigger a domino effect of extinction of other species. That’s only one example. We can never know how annihilating an apex predator in the ecosystem chain can affect us in the end with a boomerang effect. Sharks are situated at the top of the food chain, like lions in the savannah. Their role is the most crucial, their numbers and birth rates are relatively low. Fishing them relentlessly induces a risk for us humans, that we can’t really predict. Catching one ship is not much, but if it helps saving our coral reef, lagoons and oceans, it is worth it.